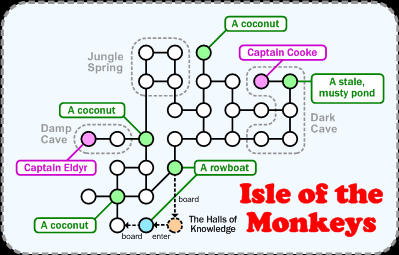 The Isle of the Monkeys is a quaint little lowbie leveling area, (somehow) within the walls of the Halls of Knowledge. If the directions below seem odd, it's because each time that you look at the portal the destination changes between Isle of the Monkeys and A Moment In Nature. Walk ( 3e, s, d, 9w, look portal, look portal, enter ) to get from DH to the room marked in blue on the first image.